How would YOU like to be the Model Presenter? This ‘how-to’ guide is filled with steps to follow and helpful hints and tips modelled on the best of the best. 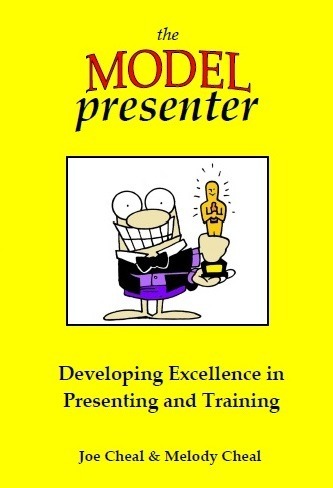 As you become the Model Presenter! Joe and Melody Cheal have been presenting and training since 1993 in both the corporate and personal development fields. They are both certified Master Trainers of NLP and have a passion for inspiring, developing and entertaining audiences. Cristiana Saudella, MBA Marketing Manager. Joanne Coulson, Life Coach & NLP Trainer. Michael Kjaersgaard, Neurocoach, Certified NLP-trainer. Andrew Holland, Coach & NLP Trainer. * What is the model presenter? * Inviting questions: What if there are no questions? * Yes, but what if…? * Nervousness: What and why?